Strategy is the secret to a winning game plan. Strategy is the secret to a winning game plan. In order to win, your brand needs a game plan. Once we have all of our puzzle pieces laid out, we can develop a targeted marketing strategy that supports and aligns with your business’s branding framework. Our integrated marketing plans are designed to work holistically with your organization. Strategy takes you from invisible to influential. Let’s find you fans and followers—the modern way. We help you create brand advocates from existing customers and acquire new ones with a quality communication strategy that touches people on all levels of the buying and engagement cycle. Change hearts. Change minds. Transform perceptions. Get better than you expected. 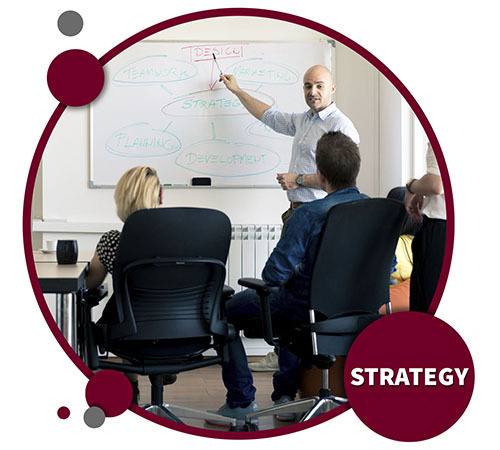 Using marketing insights informed by our knowledge gathering phase, we can develop a fair and realistic timeline of marketing initiatives that align with your strict budget for the most effective and efficient strategy, clarifying our course of action. Our goal is to save you time, effort and money so you see the greatest ROI possible. Your custom marketing plan is monitored regularly so that it syncs with your missions, vision and product and is totally adjustable according to timeline, budget and initiatives. Complete respect for resources and ROI. At Red Crow Marketing, we’re known for having exceptional budget tracking based on strategic objectives and planned campaigns. And, we’re completely transparent when it comes to budget. You’ll get access to both planned and actual expenses, as well as allocations by initiatives, segments and geographical targets in real-time.